It has been said that windows are the eyes of your home, allowing you to observe what’s going on outside and also let sunlight in. But the purpose of windows goes so much further than this. As homeowners, we rely on windows not only for ventilation and natural lighting, but for protection and energy efficiency as well. Replacing your windows is a big investment. That’s why the first step of your window upgrade should be deciding what material you are choose, and why. The experts at Brock Doors and Windows are glad to help you learn about the benefits that North Star vinyl replacement windows can offer you. When you buy our North Star vinyl windows, you know that you’re getting the best value and quality for your investment. North Star vinyl replacement windows are tested and certified by the Canadian Standards Association and they are designed to meet or exceed industry standards. North Star vinyl replacement windows will save you money on your energy bills, and they are built to maintain the comfortable temperatures that keep your family cool in the summer, and nice and warm in the winter. Unlike wood windows, North Star vinyl replacement windows are easy to maintain, and they have a built-in finish, and so will never require painting or staining. North Star’s innovative E-Z screen features smooth edges that won’t snag on draperies, and its ease of use is incredible. Simply apply downward pressure on the screen to pull it out, and to replace it, simply pop it back into place. There are many glass choices available for vinyl replacement windows, and the right combination of these options will give your windows superior energy efficient capabilities. Low-E coating is a microscopic layer on the glass, which has a high reflection rate. This minimizes radiant exterior heat which prevents heat gain in the summer while retaining heat in the winter. Vinyl replacement windows with a Low-E coating can significantly reduce your home’s energy loss. Argon gas fills the space between window panes helping prevent heat loss and improve energy efficiency, but Krypton gas is even denser than Argon, and improves thermal performance even further. Bronze-tint glass cuts down on the glare and amount of heat that can enter windows. Obscure glass is used where a higher level of privacy is desired, because it offers an effective shield from outside while still allowing sunlight in. It’s commonly used for bathrooms, basements or along walkways. Brock offers obscure glass in a variety of different patterns. Brock has been supplying industry leading, attractive and energy-efficient Toronto vinyl windows and patio doors for over 25 years. We have the expertise to help you choose the vinyl replacement windows that will enhance your home’s performance and energy efficiency. 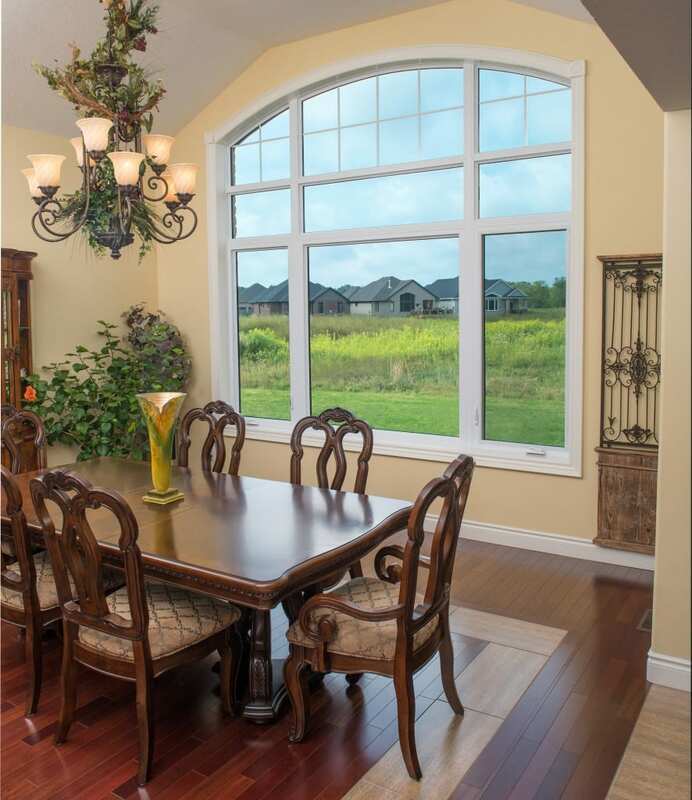 Whether you’re building a new home or upgrading to today’s standards, Brock is your clear choice for windows that are not only beautiful, but offer exceptional performance, energy efficiency, and long-lasting value to your home.